What Causes Normal Pressure Hydrocephalus? What are the Symptoms for Normal Pressure Hydrocephalus? What are the Types of Hydrocephalus? What are the Risk Factors for NPH? What is the Treatment for Normal Pressure Hydrocephalus? What are the Benefits for Shunting? What are the Risks Associated with Shunting? What is the Prognosis for Normal Pressure Hydrocephalus? What are the stages for NPH? How do I Prevent Normal Pressure Hydrocephalus? What Drugs are used to Treat NPH? NPH is an abnormal amount of buildup of CSF, or in other words, cerebrospinal fluid in the brain’s ventricles. This generally occurs if the normal flow of this fluid is blocking pathways in the central nervous system. By doing so, the ventricles then enlarge and more pressure is put on the brain. This disease is mostly misdiagnosed due to the symptoms that are similar to Alzheimer’s, Parkinson’s, or Creutzfeldt-Jakob disease. A head injury, bleeding around the brain, strokes, meningitis, or brain tumors are all potential causes of normal pressure hydrocephalus. This can also occur after a faulty surgery done in the brain; however, these conditions aren’t clear, in most cases, when doctors don’t detect any of these happenings, the cause of NPH is unknown. Although Normal Pressure Hydrocephalus is a progressive disease, symptoms tend to worsen very gradually in comparison to their subtlety in first stages. While Age is considered one of the primary reasons for NPH, researchers argue that most causes result from surgical risk factors when diagnosed. A variety of tests promote prediction of a good response to shunting. A common used treatment for treating NPH surgically is shunting. This is to place a tube into the brain in order to drain excess fluid from blocking important pathways in the central nervous system. This extra fluid then travels through the shunt in the abdomen, and is absorbed by the body permitting them to return to their normal size. Symptoms of gait disturbance, mild dementia, and bladder control problems may improve within days of shunt surgery. There is currently no adequate way of predicting how fast, or to what extent the improvement will occur according to Hydro Association. Those who do improve, changes are seen in the first weeks although some people may take longer to recover. Clinical improvement varies from person to person and although some may reach a plateau others may improve for months then start declining once more. Ultimately, although shunting can lead to a variety of affecting variables, if a patient has more symptoms associated to NPH, shunting is prone to result in a successful recovery. Obstruction: original symptoms of NPH return within a few days, weeks, or months but are usually easily fixed and rarely result in serious outcomes – even though further surgery may be necessary. Shunt Malfunction: This typically occurs when either end of the shunt is incorrectly positioned and the valve fails to function properly, without CSF reabsorbed. A remedy for this includes a surgical procedure after noting the malfunction occurred. Obstructed or malfunctioning shunts may also occur if patients experience the same symptoms prior to the surgery. Infection: An infection may form involving the surgical wound, shunt, or CSF. Bleeding: May occur in the brain or ventricles, including a seizure. Subdural Hematoma: A subdural hematoma or blood clot is one of the most severe complications with people having NPH and a shunt – the probability of this risk is 5 to 10 percent. As most shunts drain CSF from the brain, this may cause the surface of the brain to pull away from the skull and can therefore lead to tearing of blood vessels travelling from the scalp to the surface of the brain. 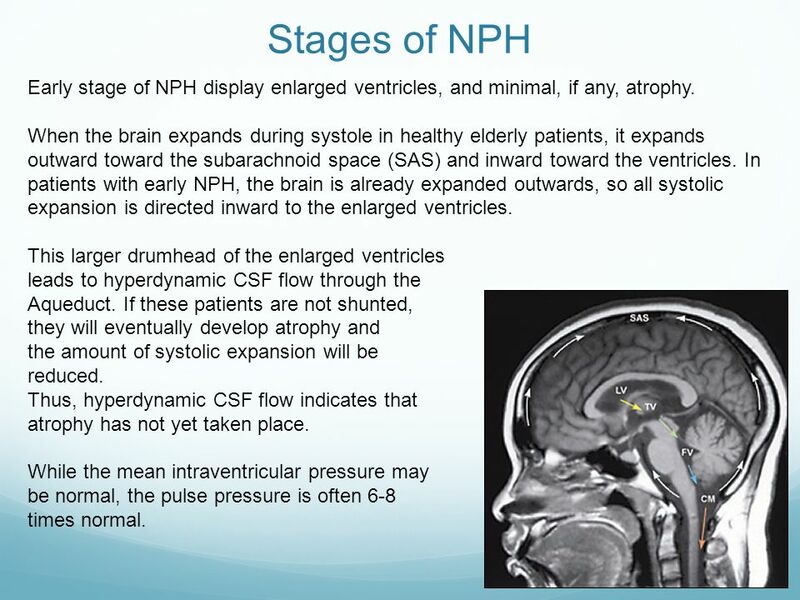 Symptoms of NPH usually worsen over time if not diagnosed or treated in early stages of normal pressure hydrocephalus. Although people may experience temporary improvements and different results with the installation of a shunt, some may recover completely and have a good quality of life. However, without treatment the disease will progress and could eventually be the cause of death. What are the Stages of NPH? In healthy patients, the brain expands toward subarachnoid space (SAS) which is the interval between the arachnoid membrane and the pia meter; occupied by a connective tissue. However, in patients with early NPH, the brain is already expanded outwards, so all expansion is directed towards the enlarged ventricles. These enlarged ventircles lead to the CSF flow through the aqueduct, and if patients are not shunted, the amount of systolic expansion will be reduced. This creates a dangerous pulse pressure as it often is 6-8 times the normal. Wearing a safety helmet when biking, skating, rollerblading, skiing, or snowboarding. These also help reduce the risk of high blood pressure, heart disease, diabetes, and stroke, most of which lead up to NPH. No definite evidence pertains that medication can successfully treat NPH, and while levodopa and carbidopa don’t seem to benefit patients with normal pressure hydrocephalus, this usually may represents misdiagnosed cases of Parkinson’s disease. However, poor candidates for shunt surgery may consider having repeated lumbar punctures in combination with acetazolamide. Shunting normal‐pressure hydrocephalus: Do the benefits outweigh the risks?